Coral.co.uk is an online betting service part of the immense network of over 1,700 Coral retail betting shops that have been providing customers with consistent product experience for decades. The site is not just an extension of that retail service; it is an entire different community with its own distinctive nature, featuring a fast-growing area of in-play betting that makes Coral one of the market leaders in providing online betting. All of Coral’s online betting services have been made available for use through mobile betting apps, which makes for a really convenient sports betting experience. Newly registered players at Coral can score £50 as free bet, as a reward for joining and betting with one of the biggest British sportsbooks. Getting the offer is fairly easy and you are required to follow several simple steps explained below in detail. In summary, you have to make a deposit and place your first real money sports bet. As soon as the bet settles, Coral will match the amount of your stake with a free bet to a maximum of £50. This offer is only available to residents of the United Kingdom and Republic of Ireland. As soon as the qualifying bet has been placed, the free bet will be triggered and will be available for use. The free bet offer does not apply to subsequent bets, only to your first ever bet made with your Coral betting account. The offer needs to be triggered within 14 days after you have registered your account. If you place your first sports bet after 14 days have passed from registration, the bet will not qualify for the offer and you won’t be able to use any free bet. You have to wager the free bet in full and you can use it for placing win and each-way bets, for making accumulators with single, double, treble, 4-fold or more selections, as well as on forecast, and combination. 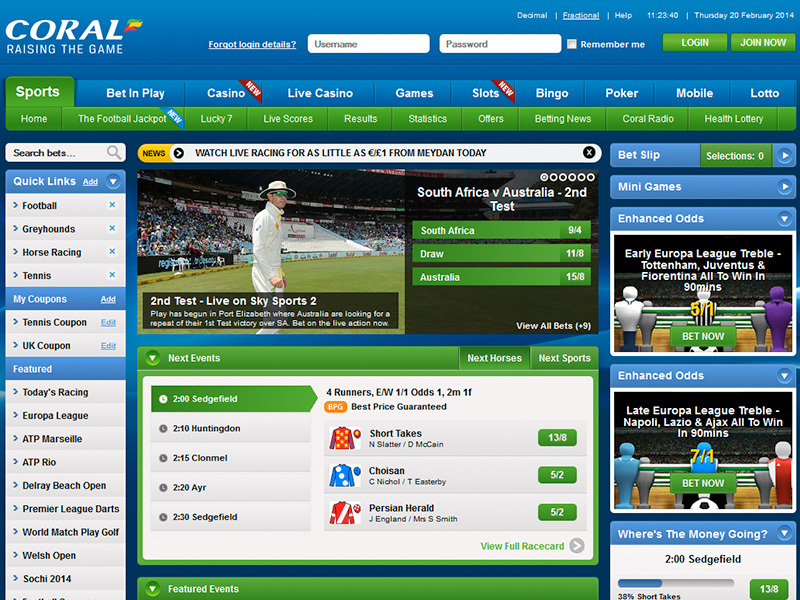 The first step towards getting your Coral free bet begins with registering for an account at Coral.co.uk. Click on the banner at this page and you will be taken to Coral’s website where you can begin with registration process. Sign up for an account by clicking on the green ‘Join Now’ button at the far top right of the home page. By clicking on it a registration form will appear before you. Fill in the registration form by entering all relevant and required information about you, including a user name and a password that will be easy for you to remember. After your account has been created, all you have left is to make a deposit in order to be able to make your first real money bet. You can do that with several different payment methods ranging from credit cards to e-wallets. Next, make your first real money bet with the funds you have deposited. The bet must be placed on a selection at odds of 1/5 (1.20) or greater. Coral will then match the stake of the bet to a maximum of £50 as a free bet token. Coral is a trusted brand that has been operating for over 8 decades now all over the United Kingdom and online since the launching of Coral.co.uk. The company exists since 1926 and is operated by Gala Interactive. Coral holds a license issued by the Government of Gibraltar and its operations are regulated by the Gibraltar Gambling Commissioner. Coral is really great because it possesses this sense for offering top betting services. It offers live racing commentaries every day and has a comprehensive in-play betting service. You can watch live football, snooker, tennis, basketball and rugby games via Coral’s Live Stream service, through which over 5,000 events are streamed for free. Coral is popular for its interesting football betting competitions for players, like the Football Jackpot with which Coral has paid out over £2,000,000 in prizes so far, or the Lucky 7 predictor game that can help you win £1,000 just for predicting the outcome of seven football games. Coral features an all new in-play betting service where now more matches and more markets are offered with new and improved scoreboards and awesome multi view page personalization. Best Price Guaranteed is available at Coral on all racing fixtures throughout the United Kingdom and Republic of Ireland, offered for single and multiple bets at either early or board price.